Vasodilation is a term given when the blood vessels widen and encourage the blood to flow more effectively. Anything that contributes to this process is known as a vasodilator and the term does not necessarily refer purely to drugs. When we are hot or flushed our blood vessels widen, allowing the blood nearer to the surface of the skin and occurs partly as a cooling mechanism; this process is vasodilation in itself. There is however a group of drugs that are often used for cardiac patients and those suffering with high blood pressure (hypertension) that cause the blood vessels to dilate and are called vasodilators. Vasodilators work by acting on the smooth muscles of the body, in this case the blood vessels. As they relax the vessel, the internal diameter of the vessel increases which can ease the passage of blood through the vessel. As the blood doesn’t have to carry as much force to get through the vessel, the blood pressure drops which decreases the workload of the cardiac muscle. There are different types of vasodilators, some target the arterial vessels, some aim to work more on the venous vessels (veins) whilst many are a combination of both types and work fairly equally on the two. The type you will be offered will depend on your condition and the aim of the drug therapy. Unfortunately, like most drugs, vasodilators can carry some side-effects. As with all forms of medication the chance of an allergic reaction is possible though rare. There is also the possibility of feeling faint or dizzy, especially when rising from a lying or seated position to standing up. This is because in healthy people who are not taking the medication and do not have any cardiac or vascular impairment, the blood vessels automatically adjust to the change in position and constrict (narrow) to accommodate the change. However, using vasodilators can override this natural function and leave the vessels as dilated as they were before the standing position was assumed leading to a sharp drop in blood pressure which results in feeling faint or dizzy. 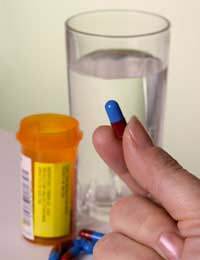 Always tell your doctor of any effects you think your medication may have caused, as your dose or type of drug may need altering. The nature of your condition will determine which form of vasodilator you are offered. Those with angina may benefit more from taking a vasodilator that acts on the venous blood vessels. This reduces the pressure that the blood returns to the heart meaning the blood that goes through the heart and has to be pumped back out carries less pressure. This decrease in pressure allows for a drop in the force at which the heart has to work and decreases the oxygen demand within the heart muscle itself. This works because during an attack of angina, the coronary arteries are working very hard to keep up with the oxygen demands of the cardiac muscle, so if this demand is decreased, the result is a decrease in the likelihood of angina. This type of vasodilator is also good for treating heart failure as swelling in the tissues is a common symptom of the condition. By increasing the ability of the blood to travel back to the heart and lungs using venous dilators, the chances of retaining excess fluids in the tissues of the extremities is decreased. Arterial dilators are used in the treatment of angina, heart failure and high blood pressure. They work by reducing blood pressure and the pressure on the heart by reducing the amount of resistance to blood flow within the walls of the blood vessels. This means that the heart does not have to pump so hard to get the blood through all the arteries which is not only beneficial for the blood vessels but reduces the workload and oxygen demand on the cardiac muscle which helps to reduce anginal pain. Most forms of vasodilators used do contain substances that work on both the arteries and the veins, so unless you have very specific reasons for needing purely an arterial or venous dilator, you will probably be given the combination drug. Vasodilators are very useful drugs and are frequently used in the treatment of high blood pressure, angina and heart failure. Due to their effect however, they may be unsuitable for use in those with coronary artery disease.